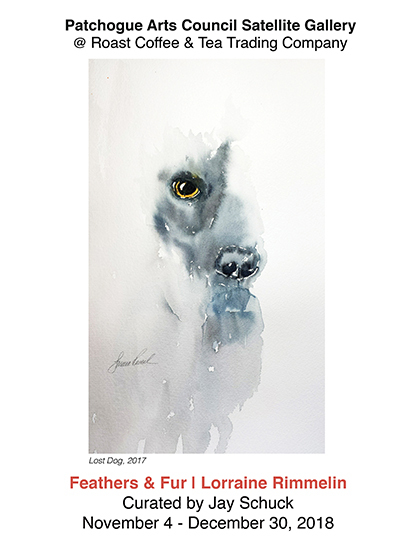 Exhibit: "Feathers & Fur" by Lorraine Rimmelin | Patchogue Arts Council, Inc.
Satellite Gallery at Roast Coffee & Tea Trading Co.
Lorraine Rimmelin is a fine artist from Long Island, NY. She is a signature member of the North East Watercolor Society and a member of the Patchogue Arts Council. Her paintings have been exhibited across Long Island and New York City, with select exhibits at Schneider Gallery (Rochville, NY), Orchard Windows Gallery (New York, NY), and Patchogue Theatre for the Performing Arts (Patchogue, NY). For more information on the artist, visit her websites lorrainerimmelin.wordpress.com and www.watercolorartisan.com. ABOUT THE PATCHOGUE ARTS COUNCIL –The Patchogue Arts Council was formed to encourage, support, and promote the arts while aiding in the revitalization and sustainability of the community. The Patchogue Arts Council is a 501(c)(3) non-profit organization whose focus is to serve the greater south shore of the Town of Brookhaven. The Patchogue Arts Council is located at 20 Terry St., Suite 116, Patchogue NY. For more information visit www.patchoguearts.org, call 631-627-8686, or email info@patchoguearts.org.